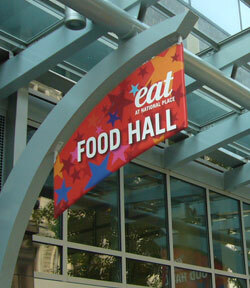 Looking for a quick and easy spot for lunch while you are touring DC with your family? 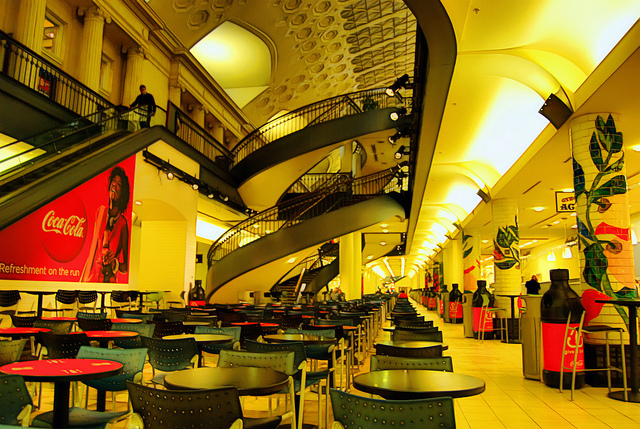 A food court has something for everyone and there are several in DC to keep in mind as you visit the sights in the city. Located near the U.S. Capitol, accessible by metro and home to many of the city’s tour bus companies, Union Station is a convenient place to stop for a quick bite to eat. Located on the lower level of Union Station, you will find typical fast food eateries such as Pizzeria Uno, Burger King and China Kitchen. One of my favorites, Chipotle, is also located there. If you would like to sit down with a waiter try Johnny Rockets for a hamburger. Another convenient place to stop for lunch is the lower level of the Ronald Reagan Building. Known as one of largest federal buildings in the city and home to many government agencies, the building is also home to a food court which is open to the public. (You will have to go through metal detectors to enter the building.) The Ronald Reagan Building is located downtown near the National Mall which makes it a convenient place to stop if you have spent the morning touring the monuments or visiting the Smithsonian Museums. The food court at National Place (or in the National Press Club Building) is also conveniently located downtown and near the White House and Metro Center. Here you will find Five Guys Hamburgers, which is always a hit. You will also find Quiznos Subs and Moe’s Southwest Grill. Click here for a complete list and coupons! 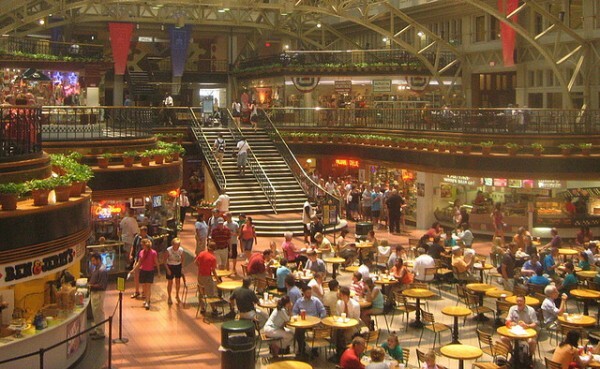 The Old Post Office Pavilion – home to the Bell Tower, a must see – is also home to a food court in the buildings atrium. You will find everything from bagels to Ben and Jerry’s ice cream and pizza here and it is just a block away from the National Mall. Click here for a complete list of restaurants. A hungry kid never makes a good tourist, but these options allow you to make a quick stop to refuel.